Presented for the fourth time at Montalvo, this class is appropriate for both beginners and returning students at all levels of skill! Bring your consciousness into the moment as you see, touch, smell, and listen to the beauty of flowers! A centuries-old art form, ikebana calms the spirit, focuses the mind, and teaches the eye to identify the beauty in the myriad details of the natural world. Each participant will learn a traditional form of ikebana, then subsequently change it into a modern style with a new creative theme. Both new and returning students are welcome. Instructor Yuko Tiernan will show students how to use “horsetail” plants in creative arrangements. 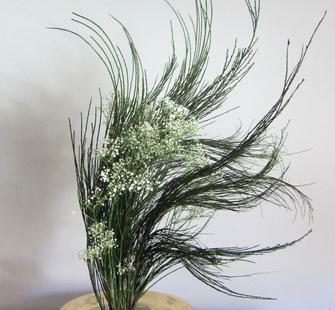 Horsetails give designers a lot of flexibility to add personal touches to the traditional Ikebana pieces. At the end of the session, you'll have a beautiful and unique arrangement to bring home. Fee includes a kenzan (pin frog), a plastic vase, and flower materials, but please feel free to bring your favorite vase and/or kenzan if you have one. A plastic bowl of 5”-10” diameter (such as a small salad bowl or Tupperware container) to cut flower stems.